Razberi ServerSwitchIQ Enterprise appliances are ideal for high performance edge video recording for mission-critical surveillance applications that require smart network optimization. 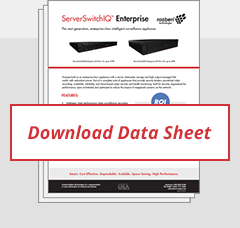 Enterprise models include a managed 24 port PoE switch, high performance RAID-configured enterprise-class hard drives and options for redundant power. More than an NVR, these purpose-built intelligent appliances come bundled with Razberi CameraDefense automated cybersecurity protection and Razberi Monitor for premise or cloud-based health monitoring. The ideal solution for reliable, efficient and mission-critical edge recording. Real-time alerts through Razberi Monitor to support VMS dashboards and Security Information and Event Management (SIEM) products.